The Alexander Calder Foundation presents color lithographs misattributed to Alexander Calder often sold by auction houses and art sellers. Put another way, these four misappropriated works are counterfeit and have no value. Because the works are overt counterfeits, we would encourage any buyer who has been duped to demand a refund if the counterfeit work was purchased within the last four years from a United States seller. Tweets about "4 Lithographs NOT Calder"
What does the Calder Foundation state about these Fake Lithographs? 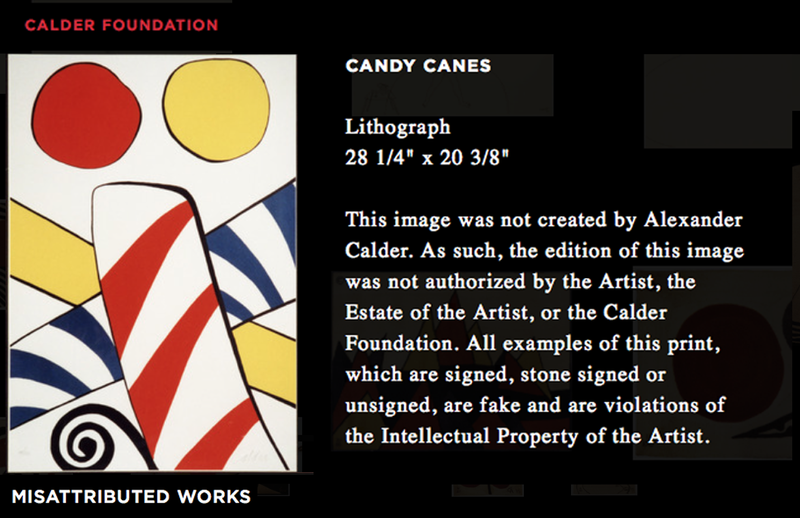 The Calder Foundation states each of the four counterfeits violates the Artist’s Intellectual Property Rights and is often fraudulently misattributed to Alexander Calder. 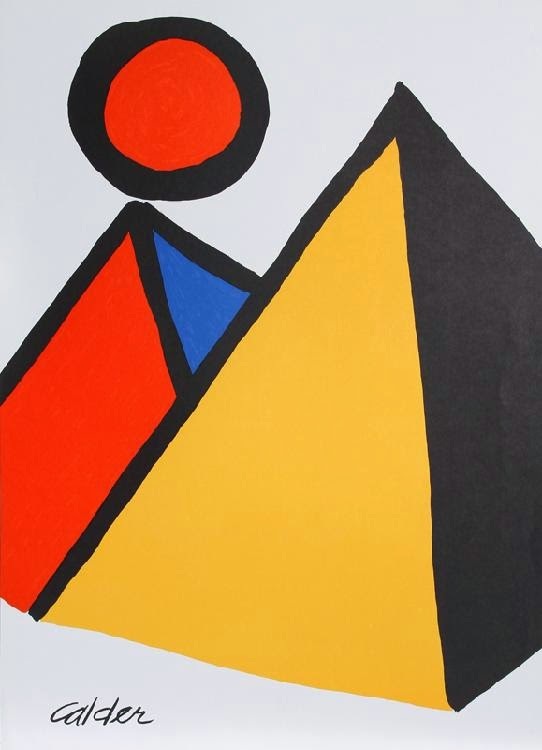 Sellers erroneously state the Color Lithographs that look like Calders are accompanied with a certificate of authenticity, which again is just a rouse, as the COA is also counterfeit. Sometimes the seller will state the counterfeit Calder is pencil signed, unsigned or signed in the stone. 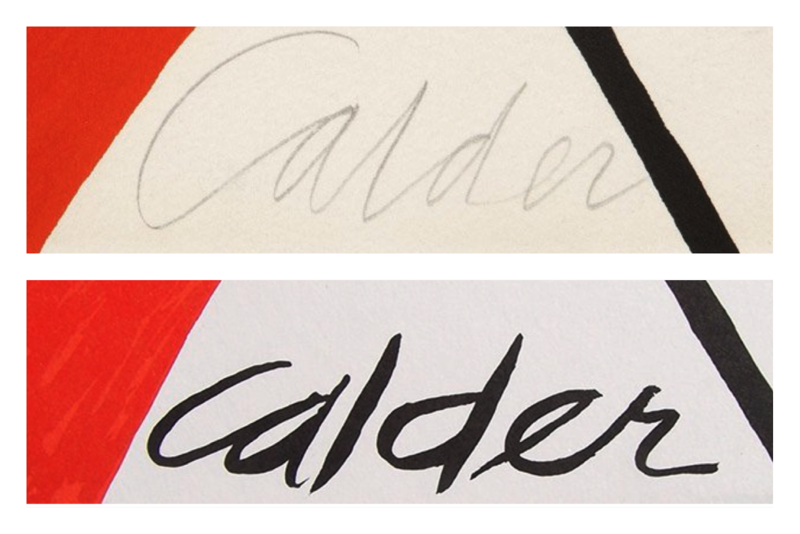 Since each is a counterfeit, whether the seller states the purported Calder is signed in pencil or not, is just a fantasy, a total fabrication; a violation of the intellectual property rights of the artist. The Alexander Calder Foundation has established a procedure in which owners of purported Works of Alexander Calder can submit the respective work of art to the Foundation. dealers & auction houses who sell art by Alexander Calder know the Calder Foundation does not provide information on registered artworks, meaning that it is impossible to verify works that are already registered. What this means is that if someone tells you a work is registered, your acceptance of the information is based on the trust method, as it is impossible to actually verify this information. Owners of works attributed to Alexander Calder may apply to register their works in the archive by completing an Application for Registration. 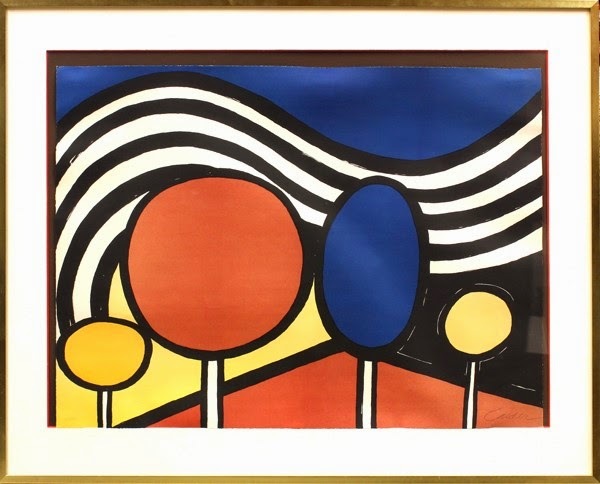 Lithograph Titled "Candy Cane" By Alexander Calder. Beautiful Art Piece On Extra Thick Paper With Gorgeous Vibrant Colors. Sheet Measures 28" X 20". Published In 1975 By Xxe In Paris, France As A Rare Plate Signed Limited Edition Of 500. Publishers Stamp Is On Back Of Image. Documentation fraudulent; why did eBay even allow the lot to be listed? Falsely described; NOT A signed Limited Edition of 500 impressions. Counterfeit Publishers Stamp does NOT transform the print so it is authentic. Accompanied with a certificate of authenticity; not from anyone legitimate. What does the Alexander Calder Foundation state about this counterfeit? 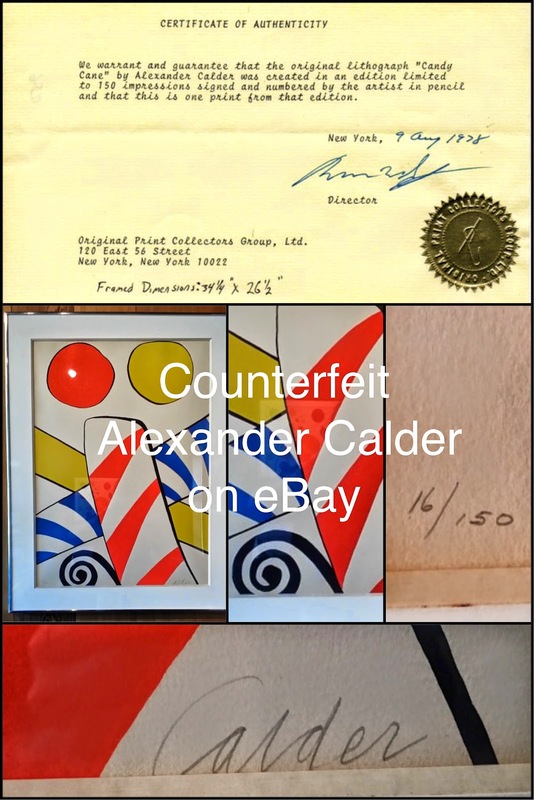 The Alexander Calder Foundation states this counterfeit Calder print comes from a group of prints not created by Alexander Calder, nor authorized by Calder and/or the Foundation. All examples of this print, whether signed, stone signed or unsigned, are FAKE and are violations of intellectual property of the artist. 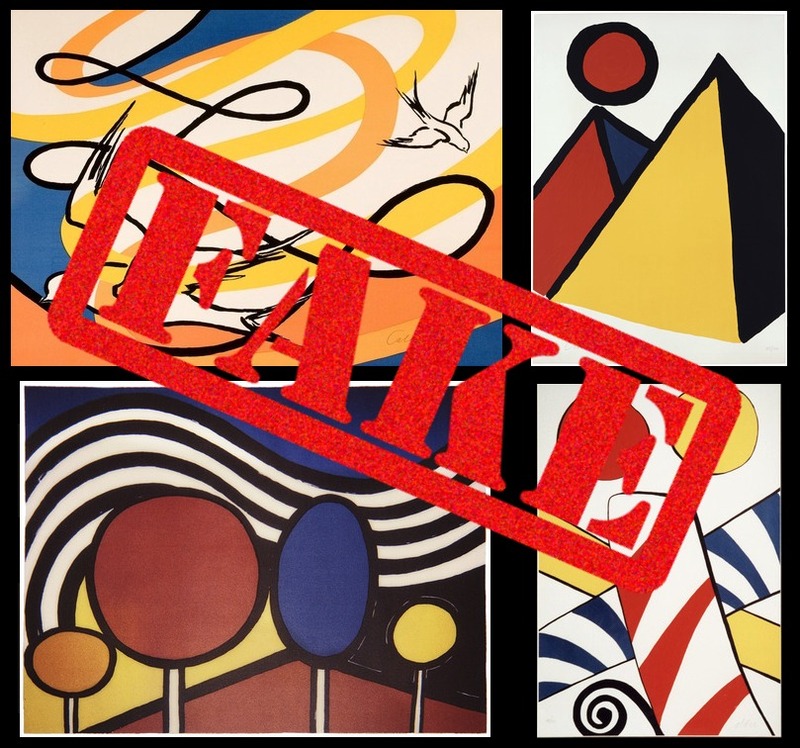 Too many sellers have sold counterfeit Calder Lithographs to show every instance. However, any seller/firm that sells or has handled Alexander Calder works with an Application Number authorized by the Alexander Calder Foundation should know better. Professional Art Sellers who sell these fakes should get no free pass. Why risk doing business with someone who buys and sells counterfeits? 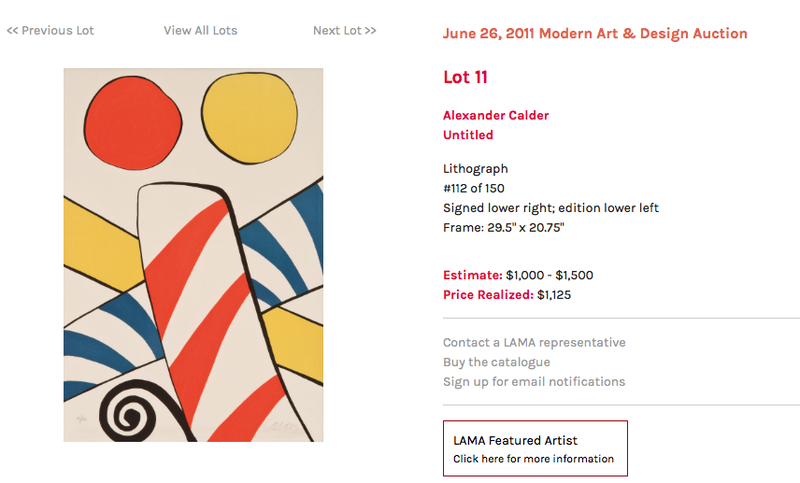 LA Modern, who states that Alexander Calder is a featured Artist, sold a counterfeit impression documented as Alexander Calder Untitled, edition number, 112/150 for $1,125. on June 26, 2011. Furthermore, LA Modern has sold numerous tapestries documented as Works created by Alexander Calder when the Calder Foundation states otherwise, including not After Calder. 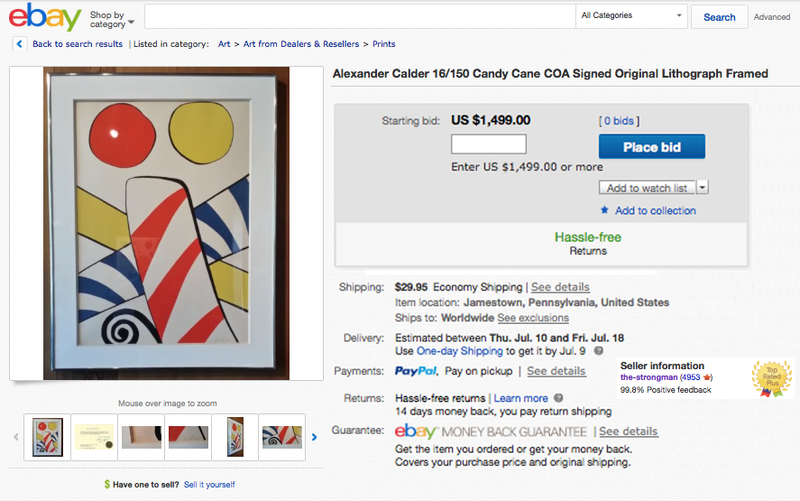 Despite the fact the Alexander Calder Foundation has overtly stated Candy Cane, Candy Canes, Untitled, etc., is NOT an Alexander Calder, this same Fraudulent Lithograph appears over 44 times on Live Auctioneers! On April 27, 2014, another counterfeit Candy Canes impression sold for $1,250 by Burchard Galleries, also on Live Auctioneers. 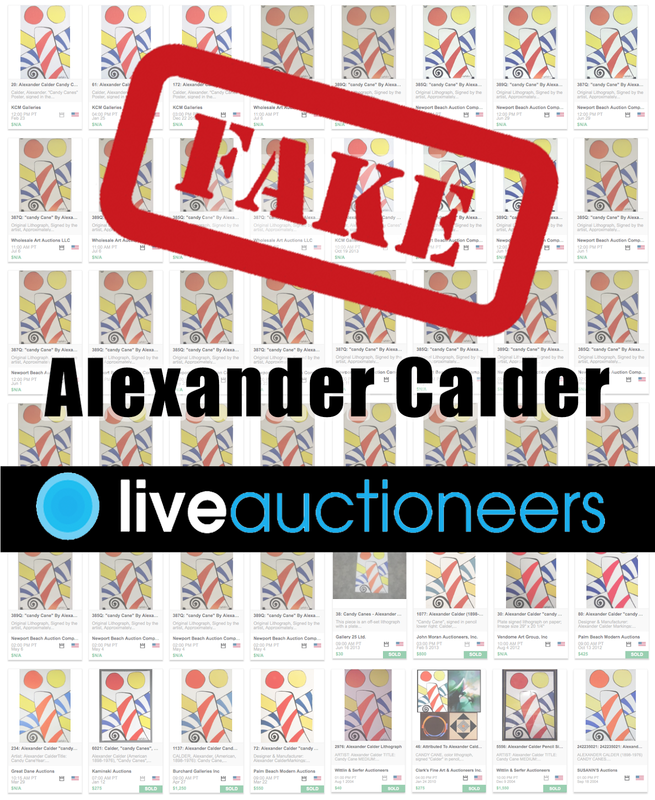 Other impressions of this same Calder fake appear 8 times on Live Auctioneers during July and August, 2014. 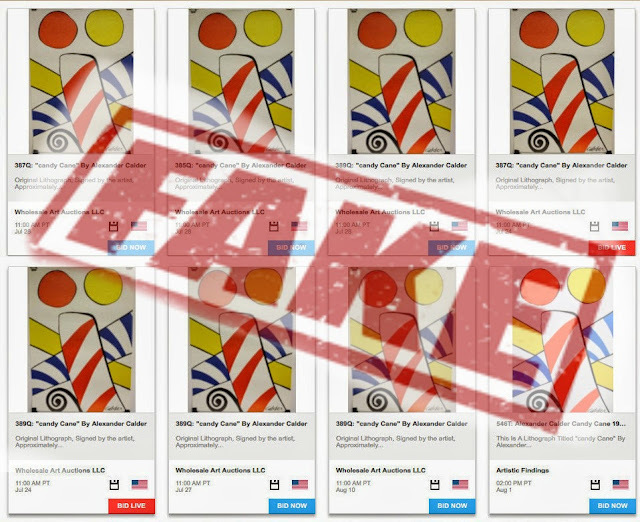 Another counterfeit Calder documented by the Calder Foundation with the title Lollipops, also known as Mountain, Trees was sold by Clars on Live Auctioneers, January 15, 2012. The Clars lot fraudulently states the print is pencil signed, from the edition of 125, accompanied with certificate of authenticity. Makes you wonder why people keep asking for a certificate of authenticity as if by magic the work will become authentic! Nothing could be further from the truth. +Joseph K. Levene wrote more about this in Fine Art or Fake Art, specifically stating: Certificates of Authenticity Do Not Transform Counterfeits to authentic Works of Art. hand signed by Alexander Calder in pencil in the lower right. numbered 2/125 in pencil in the lower left. From the Learn More section, Masterworks Fine Art further states further states The Certificate of Authenticity (COA) that accompanies every work of art and guarantees the authenticity of the piece for as long as you own it. 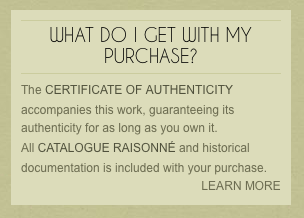 This original document protects the security and genuineness of your purchase and provides detailed information regarding your work of art. Following the State of California Civil Code 1744 COA requirements, the Certificate of Authenticity fully and accurately describes the work of art, including but not limited to the title, artist, date, medium, edition, signature, dimensions, and catalogue raisonne references. The certificate of authenticity only contains factual information that can be verified by outside sources, further attesting to its value and validity as a guaranty of authenticity. That should provide relief to the buyer since the Calder Foundation has unequivocally stated that Birds in Flight is counterfeit. 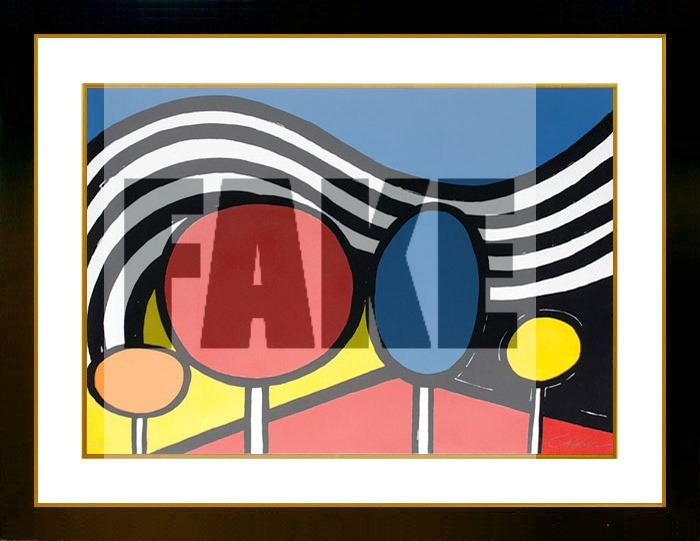 Masterworks describes the counterfeit with the following text which helps capture those looking for the same image, titled Lollipops in lieu of Trees, Mountains. Four trees reminiscent of blown up lollipops sprout up from the foreground while black and white striped mountains slope gently in the background. Birds in Flight has flown to almost a dozen other Art Sellers! 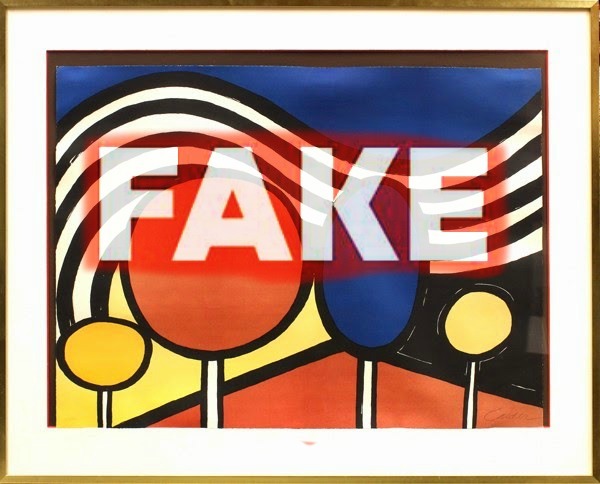 Bonhams, Bloomsbury, Doyle, Swann, Art Brokerage, Ruby Lane, Galerie Michel, artnet, 1stdibs, Grossman Gallery and Piasa who erroneously states the fake was published by Maeght. 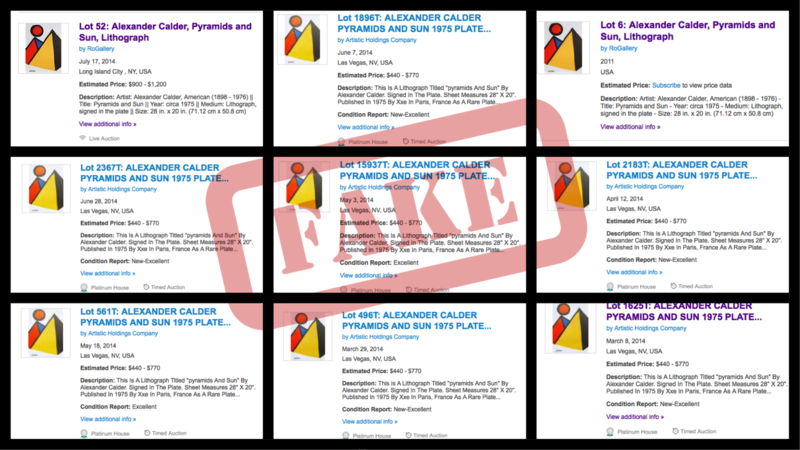 The fourth counterfeit Calder is most often titled Dark Pyramid or Pyramid, also a violation of the Alexander Calder Intellectual Property Rights. It is available for purchase on Amazon. artnet offered edition number 3/150 titled Dark Pyramid, estimate of $4,000-$5,000, 9/21/12. Like the other Misattributed Works, this Counterfeit was NOT created by Alexander Calder nor authorized by The Estate of Alexander Calder. Whether titled Candy Canes, Lollipops, Pyramids, Birds in Flight or Mountains and Trees doesn't change the fact that every image like those seen above are FAKE! Why do Auction Houses and Art Dealers offer fake Calders? 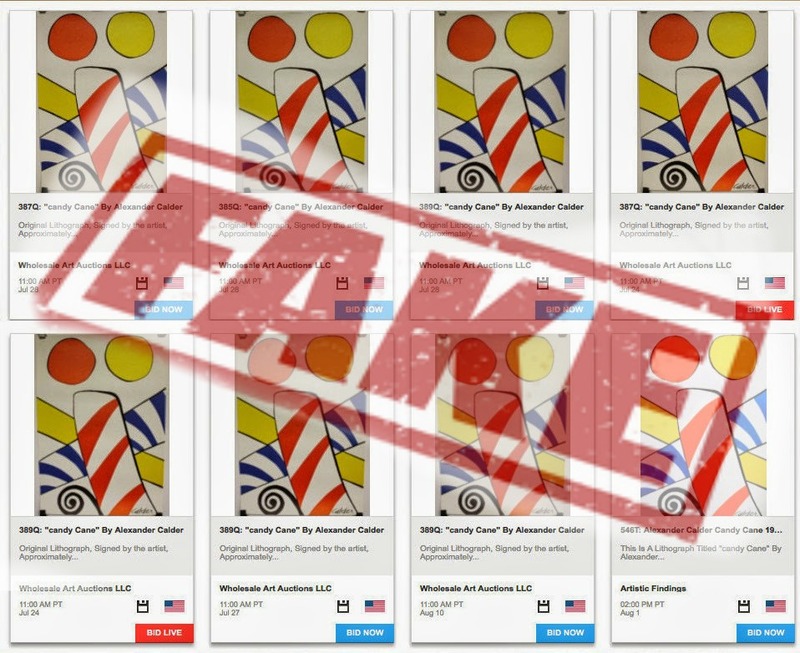 Counterfeits plague the Art Market ranging from several hundred dollars on eBay and other online art sites to multi-millions of scams such as the $80 million art scam that forced the 165 year old Knoedler Gallery to shut down. Will eBay's new business initiative force the Company to establish pro-active procedures to eliminate Counterfeit Art? First, eBay recently announced a partnership with Invaluable formally Artfact, a former eBay partner, that will bring live auctions back into the eBay platform. 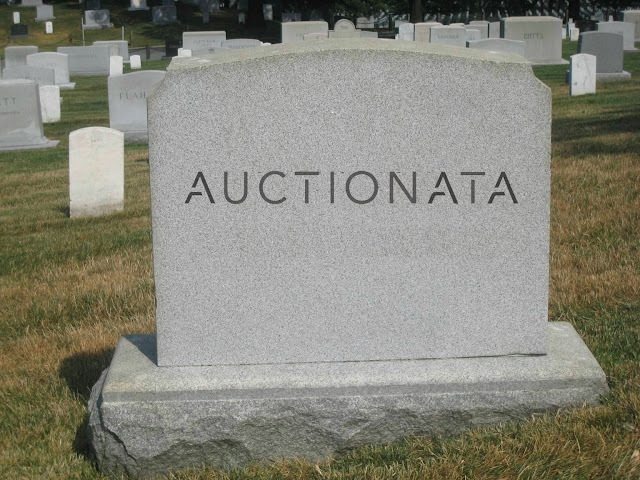 eBay stopped hosting live auctions on December 31, 2008 amid to rumors of lawsuits, shill bidding and other impropriety. 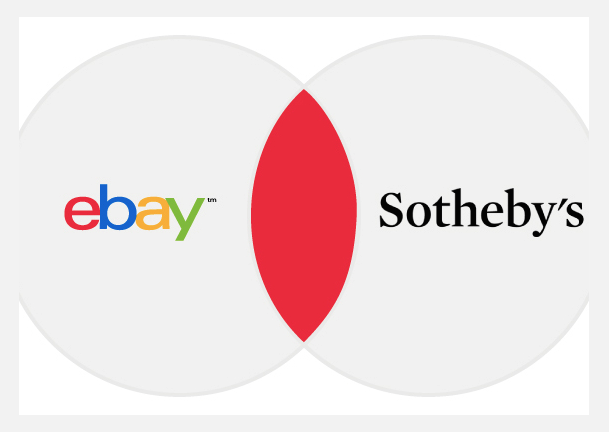 Second, eBay announced a new partnership with Sotheby's that brings auctions from 18 Sotheby's categories to eBay's 145 million users.